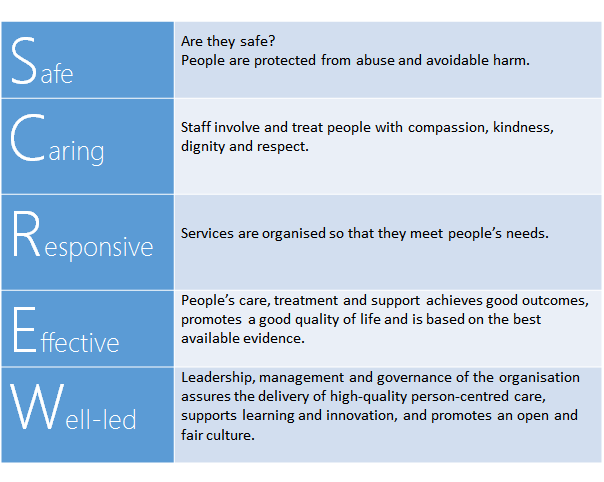 The CQC's inspection model focuses on 5 key questions that a service provider is going to be judged on. A rude acronym that makes it easier to remember the latest Guidelines. How frequently you are inspected, the size of the inspection team and whether or not you get notice of inspection depends on the nature of the Service provision and organisation. 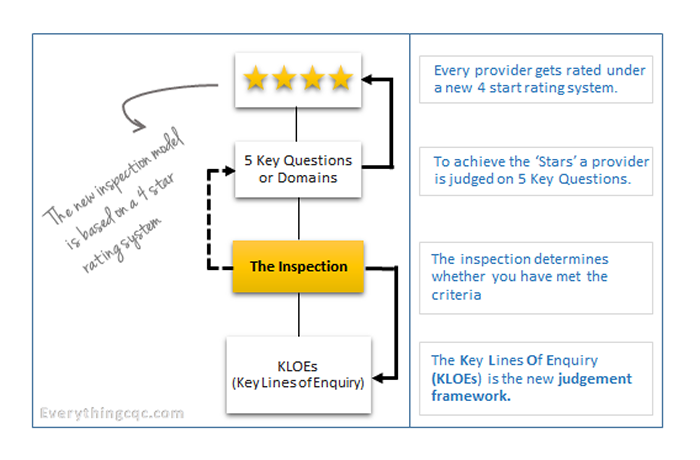 The CQC call their new Inspection model under KLOEs a Comprehensive Inspection. To look at something that is of concern; usually after an improvement notice has been issued after a previous CQC visit. These are smaller in scale than comprehensive inspections, although they follow a similar process. How often will they inspect? The CQC aim to inspect a primary medical service provider approximately once every 2 years, but some practices may be inspected more often. Will I get advance notice of an Inspection? In 2012 a concession had been agreed and only GP practices were given a 48 hours’ notice. 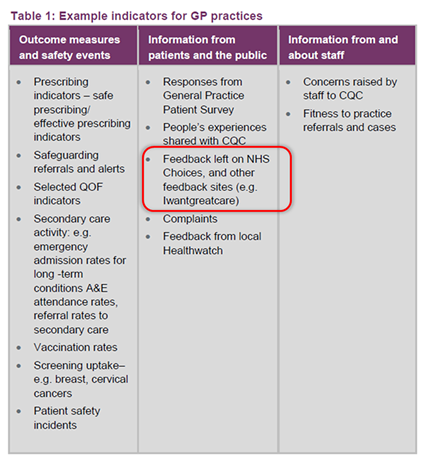 Under major changes to the way visits are carried out, from April 2014 this 48 hour period increased to a two weeks’ notice before a CQC inspection. A CQC statement has said: ‘CCGs are being given at least four weeks advance notice that their area has been selected and GP practices in those areas will have at least two weeks’ notice of an inspection as opposed to the previous 48 hours, CQC reserve the right however to inspect unannounced at any time where a practice is identified as a risk. As reported by Pulse, the Chief inspector of primary care Professor Steve Field has claimed that the change heralds a ‘new approach’ in the way the CQC works with GP practices, aiming to support them to raise standards. Whilst a 2 week notice period is the CQC's 'official' position, find out more as to what happens in reality. 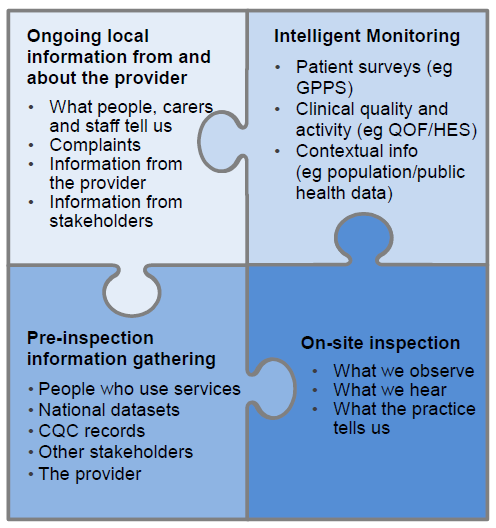 As part of the New model of regulation and inspection, the CQC recently published their Intelligent Monitoring dataset for GP practices across the country. The Intelligent Monitoring (IM) report pulls together information, available in the public domain e.g. QOF reports, Patient survey etc. to give the inspectors a clearer understanding of strengths/weakness of each provider, therefore allowing for targeted inspections visits. Whilst the CQC have set themselves targets to inspect all GP practices over the next two years it is common knowledge that they are somewhat behind in meeting these targets due to a shortage of inspectors. Targeted inspections is an efficient use of the CQC resources to prioritise when, where and who to inspect first. The final judgement of a practice is based on the inspection report and not the pre-inspection banding/risk rating etc. When CQC identifies a ‘risk’ or ‘elevated risk’, it does not necessarily mean that people using the practice are at risk, but where certain patients may be at risk. The CQC aim to update the IM report regularly, based on the most current indicators available to them. So the easiest way to change or improve your banding is to ensure that your practice is achieving the national targets. 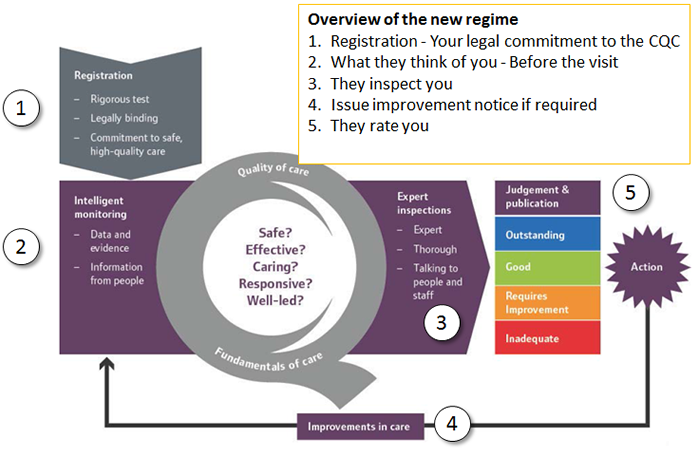 This graphic shows where the CQC will get information about you. Most of it is obvious: Complaints to CQC; whistle-blowers; Your registration form; IG Toolkit; QOF reports; Patient surveys etc. A basic rule of thumb is that if you have published information about yourself to the NHS, they will use that in the pre-preparation. Whilst most of this is expected, it is worrying that in addition to NHS Choices the CQC believe that information from private websites will also be considered legitimate “intelligence” for an inspection. CQC promoting a private website in its guidelines is quite extraordinary we think! This data gathering angle has the potential for a worrying trend. • Patient participation groups, where they exist. • Local voluntary and community groups. • Patient and carer groups. • Community outreach focus groups. • Overview and scrutiny committees. • Local NHS complaints advocacy service. • Results from patient surveys and associated action plans. • A copy of the provider’s statement of purpose. • A summary of any complaints received in the last 12 months, any action taken and how learning was implemented. • A summary of any serious adverse events for the last 12 months, any action taken and how learning was implemented. • Locum/agency use over the last 12 months (out-of-hours services only). • Evidence of monitoring the quality of services provided. • Evidence of supplying urgent/emergency medicines. What is a Quality Risk Profile (QRP)? The CQC have developed a Quality Risk Profile about your organisation to support how they monitor your compliance. The QRP helps the compliance inspectors to assess where risks lie and may prompt front line regulatory activity e.g. when carrying out a planned review of compliance, to identify and prioritise potential risks of non-compliance; which may trigger regulatory action that can include a responsive review of compliance. How is the Quality Risk Profile Compiled? The QRP is developed based on the information CQC have on you. How can I check my QRP? If you have registered, you can access your Qulaity Risk Profile by Clicking here.